Joanna Russ' 1975 novel, The Female Man, still contains the power to provoke reflective thoughts and, in many cases, strong emotional responses thirty-six years after its initial release. Even today, many of the gender issues which she raises in this highly influential novel spark debates (as witnessed in the recent round of debates over the role of female authors in SF and the perceived need for greater visibility; one such response leading to the creation of the "Russ Pledge" to discuss female SF writers more frequently) over female participation in fields that may formerly (or currently?) be seen as male domains. It is a touchy topic for some to approach the discussion of second-wave feminist critiques, particularly if the reviewer is male, but it is much worse for anyone, regardless of gender, to shy away from exploring a work that explodes discriminatory myths in a complex, wide-ranging narrative. I live between worlds. Half the time I like doing housework. I care a lot about how I look, I warm up to men and flirt beautifully (I mean I really admire them, though I'd die before I took the initiative; that's men's business), I don't press my point in conversations, and I enjoy cooking. I like to do things for other people, especially male people. I sleep well, wake up on the dot, and dont dream. There's only one thing wrong with me. In my other incarnation I live out such a plethora of conflict that you wouldn't think I'd survive, would you, but I do; I wake up enraged, go to sleep in numbed despair, face what I know perfectly well is condescension and abstract contempt, get into quarrels, shout, fret about people I don't even know, live as if I were the only woman in the world trying to buck it all, work like a pig, strew my whole apartment with notes, articles, manuscripts, books, get frowsty, don't care, become stridently contentious, sometimes laugh and weep within five minutes together out of pure frustration. It takes me two hours to get to sleep and an hour to wake up. I dream at my desk. I dream all over the place. I'm very badly dressed. This quote, along with the first one, represents much of the conflict found within the novel. 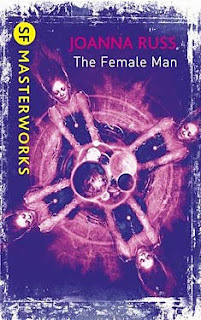 The Female Man works not only as an excellent SF novel of exploring female identity, but also it serves as an influential work of social commentary that takes as its base a fundamentally Marxist view of society, replete with superstructures and class conflict, and fuses it with second-wave feminist concerns about representation and social equality. It is not a cheery novel; fights rarely are graceful or polite. No, The Female Man stridently argues its points in short, sharp, angry bursts that shake readers' preconceptions of gender roles. This can generate confusion and awkwardness, as each gender group struggles to reconfigure their group views on what is "proper." A male holding a door open for a woman might not be polite (unless he does this for fellow males, perhaps), but instead someone who is subconsciously reinforcing social views that hold women in an inferior, "delicate" role in which the males are to be the chivalrous protectors of feminine dignity. As the four narrators traverse their worlds and see the insidiousness of sexism in a variety of guides, a commonality begins to emerge that links their disparate roles and actions into a thematic whole. The Female Man is not without its weak points, however. The stridency that makes its points vividly can also be construed as being too full of anger to reflect fully the range of social interactions between males and females and female responses to the world around them. Many readers, male and female alike, may find Russ' approach to be too stark, too black-and-white for the early 21st century (indeed, third-wave feminism has moved away from several of the approaches championed by second-wave activists). This is said not to gainsay what Russ has created, but rather to note that powerful works often do create reactions against the work as well as those in favor of it. If anything, this is a greater testimony to the influence that The Female Man still possesses over people, female and male alike, and this makes The Female Man one of the most essential fictions ever produced in the late 20th century.